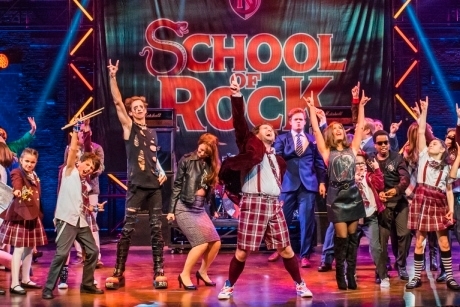 For schools considering a theatre trip in the new academic year, School of Rock The Musical has just announced it is extending its booking period. The Andrew Lloyd Webber musical will now be taking bookings until January 2019 and will also feature some new cast from the end of August. The story follows a wannabe rock star, Dewey Finn, who poses as a supply teacher at a prestigious prep school to earn some extra cash. He soon discovers the class’ musical ability and turns the classically trained class into “a guitar-shredding, bass-slapping mind-blowing rock band” and enters them into Battle of the Bands. The musical is based on the 2003 film by the same name which starred Jack Black as Dewey Finn. It includes songs form the 2003 film as well as 14 original Andrew Lloyd Webber songs written for the show. The lead role of Dewey Finn is played by Gary Trainer, who stars alongside Florence Andrews as Rosalie Mullins, Oliver Jackson as Ned Schneebly and Preeya Kalidas as Patty Di Marco. There are three teams of children involved in the musical which will be changed up for a new cast come 26th August. The new cast joining in August include Jacob Swann, Annabel Gracey and Siam Elvidge, who will play Freddy; Santiago Cerchione, Phoenix Taylor, and Jack Goodacre, who will play Zack; Eliza Cowdery, Imogen Bowden, and Audrey Newman, who will play Katie; Cole Lam, Milano Preston, and Johnny Evans-Hutchison, who will play Lawrence; Joseph Black, Harry Vallance, and Archie Lewis, who will play Billy; and Aaliyah Monk, Stella Haden, and Caoimhe Judd, who will play Summer. School rates are available for classes with ten or more. Teachers should note that the show contains occasional strong language so may not be suitable for younger years. School of Rock The Musical also runs a programme for schools to put on their own show. A visit to see the show can be linked with English, Music and Drama. For more information, visit www.schoolofrockthemusical.com.